One of the most coveted sneakers in cinematic history has fallen into disarray. 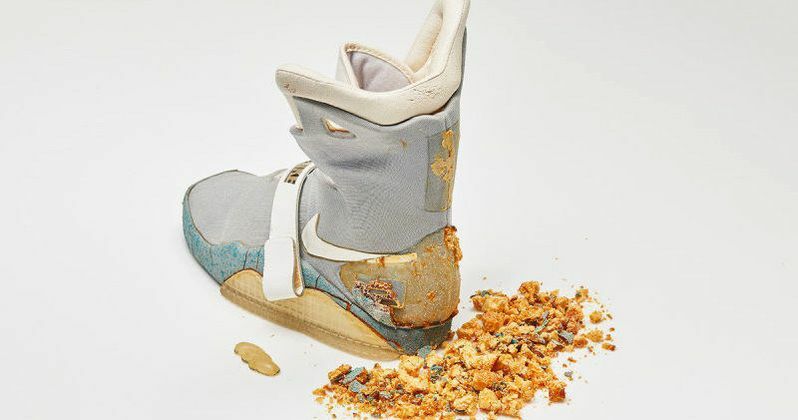 The original Nike Mags worn by Michael J. Fox in Back to the Future Part II are rotting into garbage. Yes, those cool, futuristic self-lacing tennis shoes may soon be no more. And not even a DeLorean time machine can save them. Doc gave Marty the super stylish Nike mags in the year 2015. And from the moment McFly slipped them on his feet, they became a fan favorite. Back when the sequel was released in 1989, people demanded the shoe be sold to the public. It eventually was, but not until decades later, and still without the self-tying laces. The original pair of Nike Mags that were used on screen are currently being displayed at a sneaker consignment store in Portland, Oregon called Index. But they are seriously falling apart. Most high quality shoes aren't built to last forever, and these weren't created with the same care as most Nike sneakers. They were created for a few scenes in a movie, and didn't need to survive past the shoot. The shoe fabric is still mostly intact. But the rubber pieces on the back have turned a garish orange color, and have started to crumble and rot off the shoe itself. The shoes are incredibly fragile, and can only be handled with the utmost care. Anyone moving them must wear white cotton gloves, and they are usually kept under glass. The single left shoe was auctioned off over Ebay. It fetched a healthy $92,700. The buyer had to be in Portland, though, as the shoe wasn't going to survive being transported very far without completely falling apart. It's unclear if the buyer will be able to repair the shoe and bring it back to its former glory, but that takes some of the authenticity away from its screen used quality. The Nike Air Mags that have been released over the last couple of years are still quite expensive, and hard to come by. In 2016, Nike did release a pair of self-lacing Nike Mags, raffling them off. But the shoe was not an exact replica of what Marty McFly wears in Back to the Future 2. It's surprising that Nike hasn't released a more screen-authentic and affordable pair of Mags, as they are some of the most popular sneakers of all time. Thanks to Kotaku, we have a look at the Nike's from the actual movie as they continue to rot into a pile of orange garbage.